This is a detailed reference list which draws together the various memorable props from The Evil DeadEvil Dead IIArmy Of Darkness, along with their possible availability as originals & replicas. For a general list of Evil Dead Trilogy props & collectables, please see the Collectables section. While there are literally hundreds of items shown of screen across the trilogy, this list only covers props people might be interested in trying to buy or replicate themselves. Some of the information below is fact, and everything else is carefully researched guesswork. Some of you reading this may know a lot about subjects such as firearms, cars, or antique clocks, so if you have any additional information, corrections or want to know more about an item, please get in touch via the email address at the bottom of the page. Scroll down the page or use the links below to continue. Tom started creating this item from scratch prior to leaving for Tennessee, finishing it while shooting. Already having the facial casts, he brushed about ten layers of liquid latex into some of the moulds, and used contact cement to glue these 'skins' onto a piece of corrugated cardboard. He made the pages out of office store bought parchment, bound together with paper from a grocery bag. He illustrated the book in between shooting at the kitchen table of their suburban house/production office. Once shooting on The Evil Dead was completed, Sam took possession of the book, along with the 'Kandarian Dagger', and remained with him until 1986 when he brought it with him to Wadesboro for reference use on Evil Dead II, after which Tom got the original book back, and still has it to this day. It can be seen along with many other rare items; such as Bruce's fake arm from Within The Woods. From The Evil Dead; the magnifying glass necklace, and various latex appliances including masks, gloves, and fake parts such as Linda's fake leg, severed head & torso. From Evil Dead II; the 'Book of the Dead' along with assorted 'lost' pages, the 'Kandarian Dagger', and various stop motion animation puppets. There are also a number of photo boards with many previously unpublished photos, original animation storyboards, artwork, posters, and rare magazine & newspaper cuttings. Because of scheduling over-runs during production, Tom drew up an additional contract which also stipulated that he would retain the ownership & copyright of any props he manufactured. This is something he fiercely protects to this day, which is why you're unlikely to find anyone publicly selling exact book replicas. Tom has taken legal action against a number of individuals publicly selling replicas in the past on auction sites such as Ebay, even with single/one-off items. 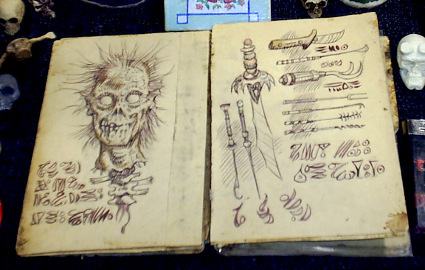 Around 2002, Tom was selling his own official replicas of the book from The Evil Dead. They were by far the most accurate & detailed replicas anyone has ever made, but did retail for around $600 each, and the entire run was limited to 100 copies. 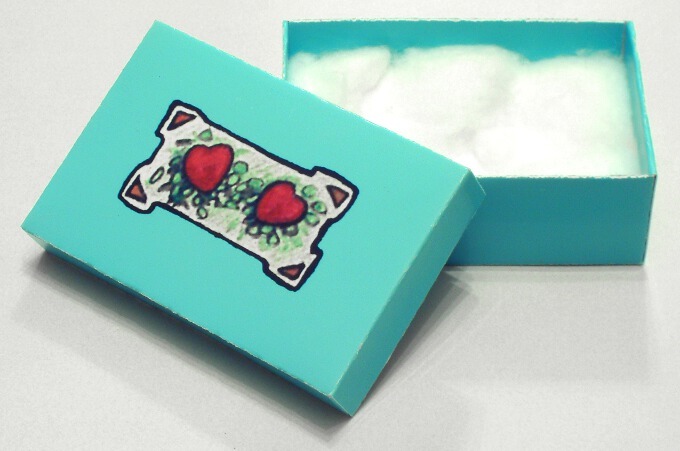 As of May 2010, Tom stated in an interview with us that he sold around 60 of these and is currently working out the bugs to make the rest of the run, so look out for this in the future. As of November 2013, while Tom is now selling Evil Dead II Kandarian Dagger replicas at conventions, his Book replica is still in the works. 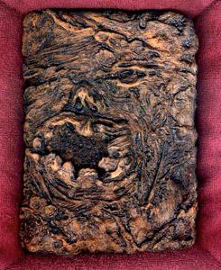 Other than Tom's replica, there is only really one other notable replica produced of this specific 'Book of the Dead' (as most replicas lean more towards the look of the book from Evil Dead II), and this was created in a 2013 project by Danish Evil Dead fan Jesper Mørch, and shown in a photo below and detailed on it's own Replica Book Of The Dead page. 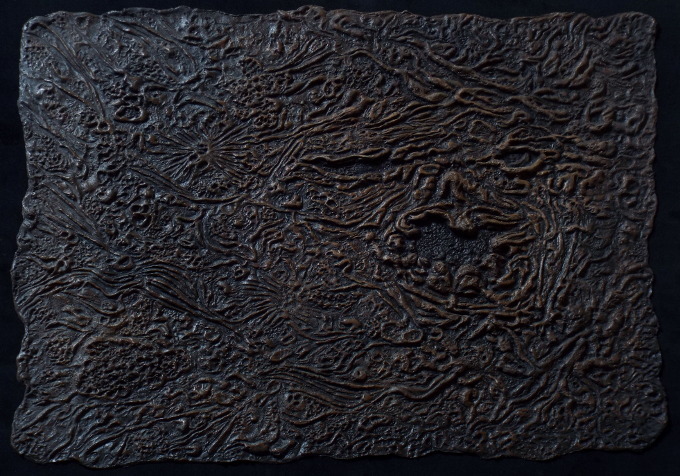 You can see the fantastic amount of detail which went into sculpting Jesper's book replica's 'skin' in the photo below, which has been laid out flat to use as a wall mounted display piece. This was made from scratch by Tom Sullivan prior to leaving for Tennessee, and its creation was surprisingly quick & simple. He bought some 1" wide flat stock of aluminium from an East Lansing hardware store, then cut it to a point with a hacksaw, and grinding the edges with a power tool. For the hilt of bones, he took a few handfuls of a papier-mâché product called Celluclay and shaped a thick curved handle over the blade. He stuck dried chicken bones and twelve-inch skeleton model kit parts into the Celluclay, and let it dry. Lastly he painted it with some acrylic paint. Above and beyond what Sam had called for the dagger to do, Tom also drilled a hole through the Celluclay & miniature skull on the hilt, so tubing could be connected and blood could flow out of the skull's mouth. The dagger as seen of screen on longer exists. Once shooting on The Evil Dead was completed, Sam took possession of the dagger, along with the 'Book of the Dead', and remained with him until 1986 when he brought it with him to Wadesboro for use on Evil Dead II. Tom redesigned the blade from a simple pointed piece of metal to a tail-like tapered set of bones, which was sculpted by Mike Trcic & Brian Rae, Tony Ellwood made a mould and cast copies of the original hilt, and then both hero & stunt copies of the knife were produced. Because of scheduling over-runs during production, Tom drew up an additional contract which also stipulated that he would retain the ownership & copyright of any props he manufactured. This is something he fiercely protects to this day, which is why you're unlikely to find anyone publicly selling exact dagger replicas. Tom and has taken legal action against a number of individuals publicly selling replicas in the past, even with single/one-off items. While a number of replicas have been produced, most are modelled on the 'Kandarian Dagger' from Evil Dead II, and there have been a handful of replicas of this dagger, including the personally made version shown below, which you can read about in more detail Here. 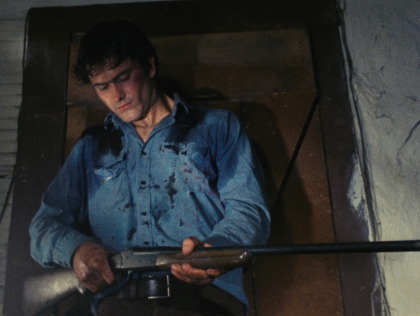 The shotgun used throughout The Evil Dead is a Single Shot Breach loading 20-gauge Shotgun, with automatic ejection and an exposed hammer. It's most likely to be a Winchester 37A 20-ga shotgun, with a 3" chamber, 28" barrel and a walnut finish. These were sold from 1973 to 1980, and fetch around $100-$150 second-hand depending on the condition of the gun. The wooden foregrip is slightly different; in some shots there appear to be two 'grooves' running down the bottom-length which aren't present on the winchester shotgun, although these could have been carved in by the owner to improve hand grip. Obviously, being a real firearm, some sales restrictions will apply, and it may simply not be available depending on your location in the world. It is unknown if this was bought especially for the production or owned by one of the crew, but Bruce has stated in the past that it now resides with his brother Don Campbell. This was one of the very few props left once shooting on The Evil Dead was completed, as they took this shotgun and a few boxes of shells, and blew up every single prop left in the house over the last days on location in Tennessee. This same shotgun features in Thou Shalt Not Kill... Except, where you see it far more clearly, along with the cabin clock. It's the gun used by 2nd Lt. David Miller (John Manfredi) in the shed destruction sequence (starting at 48m 13s NTSC), and also appears in it's 1980 Super-8 prototype Stryker's War used by Scott Spiegel in the same scene. Today, the shotgun is owned by Bruce Campbell's brother; Don, along with the original set of cabin keys. It looks a little different now, as Don puts it "Had I known it was going to be more popular, I definitely wouldn't have cut the barrel and stock off it. It's a sawn-off shotgun now, I think it's a half-inch legal, any shorter and it would be illegal". You can see Don handling the shotgun in the 2013 Evil Dead documentary Invaluable. 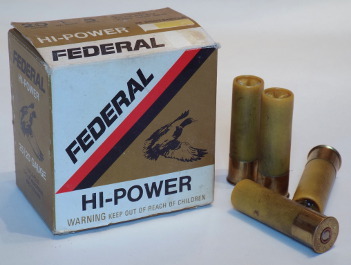 A box of Federal 20-gauge Hi-Power shells can also be seen on the cellar table. You can actually buy empty vintage shells boxes on Ebay. There are a couple of very similar, but slightly differing designs. you can see a screenshot from The Evil Dead below, with a virtually identical original box alongside. Roughly similar models come up once every so often, usually in good to excellent condition. Finding an exact match will take some searching though. One other interesting aside of note; while there were a fair number of virtually identical examples of this box available during the 70s/80s, the top flap-lid on all of them seems to open the opposite way round, to the version shown on screen, as per the above two examples. It seems most likely that the screen used flap-lid was cut off, and stuck back on the other way round, explaining this, although this could still be a previously unseen box variant. 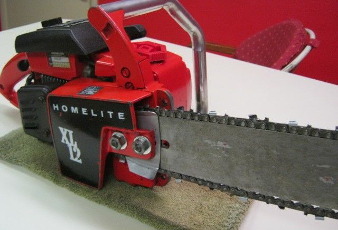 The chainsaw used was a Homelite XL-12, although the 'Homelite' logos on both sides and the top were covered over with tape. It is unknown if this was bought especially for the production or owned by one of the crew, nor is it known what happened to it after shooting wrapped. It would seem unlikely it was destroyed along with many of the other cabin props, especially if it was fully working. Homelite XL-12's come up for sale on Ebay.com, but are rarer than the Homelite XL from Evil Dead II, and typically in poorer condition. You can pay $300 for a fully working refurbished model. The design of the XL-12 changed very little over the years it was made, since it's introduction in 1963, but the colour scheme does vary depending on the year of manufacture. 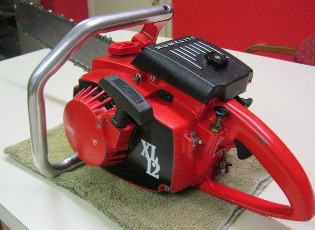 The Evil Dead exact model saw, has a red body with two painted black sections; one on the left side, and one on the right, which both have 'XL-12' written in white lettering. 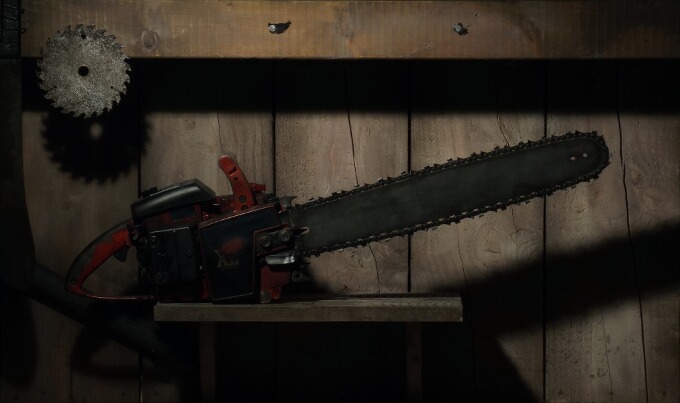 Above you can see a photo of a slightly different model Homelite XL replica chainsaw, along with a workshed background display, created specifically for use in the 2016 Evil Dead fanfilm Book Of The Dead. 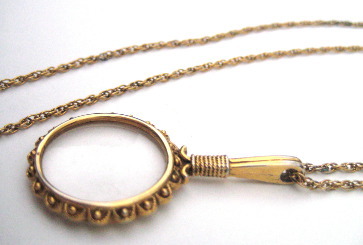 This is a silver necklace with a small magnifying glass inset. 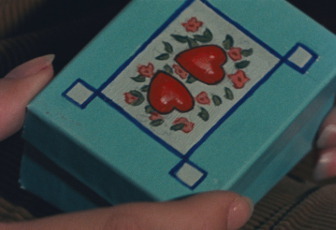 Ash gives this to Linda in The Evil Dead, and again to the same character in Evil Dead II. Sam had conceived the climactic scenes of The Evil Dead to happen slightly differently; the dawn light would come in through a cabin window, shine through the magnifying glass burning the 'Book of the Dead'. Ash was to have seen this and realized that the Book needed to be destroyed on the fire. There were actually three slightly different necklaces used acros The Evil Dead & Evil Dead II. The original was bought specifically for use in The Evil Dead around 1979 from a jewellery store in Grand Rapids, Michigan called Corey's Jewel Box (3286 Alpine Ave NW K, Grand Rapids, Michigan, 49544). 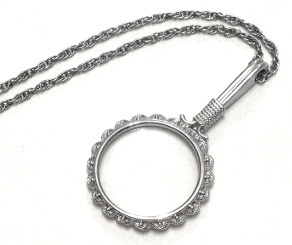 It was a Crown Trifari Silver Magnifying Glass Pendant & Chain, something you'd only be able to find in the second hand market today. Sam mentions in the 1999 Elite Entertainment DVD commentary track for The Evil Dead, that for re-shoots they had to source a second necklace, presumably after the first was misplaced. The only similar piece they could find was gold coloured, so had to be painted silver on order to match the original. Trifari at one time also made a gold version of that silver necklace, so presumably that was the one they used. You can see photos of both gold and silver versions below. 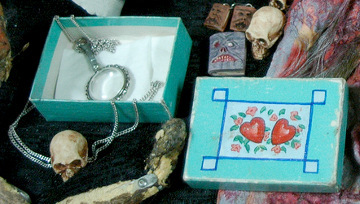 The original and re-shoot necklaces also used slightly differing sized pale-blue boxes, with different painted lid artwork. 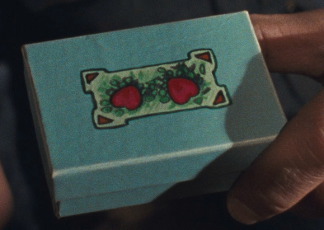 You can see examples of both in the movie screenshots shown below, with the original box on the left, and the re-shoot box on the right. It's unknown if either of these boxes were bought at the jewellers with the necklaces, or bought separately. As a pet project, to go with a personally owned silver Trifari necklace, I designed a replica of the left-hand box shown above. You can download it as a printable PDF Here. There are two pages in the PDF; one to be printed in the centre of each side of a piece of photo-printable paper or card, with the cut-out/fold lines on the matte side, and the blue artwork on the photo side. It's not perfect, but it's a decent enough replica. 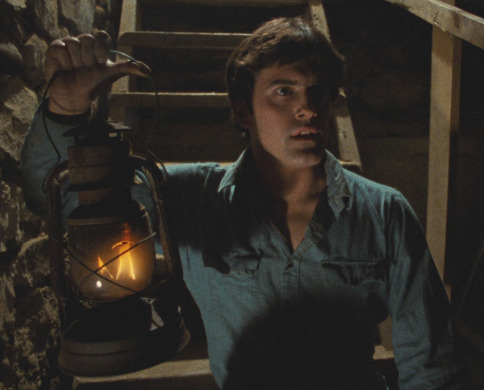 Evil Dead II's necklace is different again, and isn't the same style as the first two. It could have been made by the same company, but it's make and model is currently unknown. It's never shown on screen with a box. 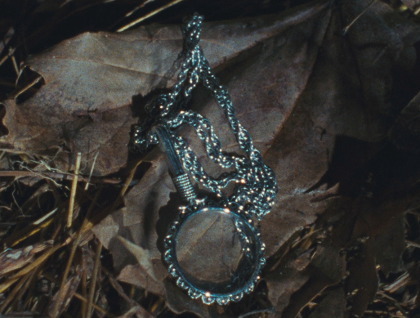 Once shooting on The Evil Dead was completed, it's unknown what happened to the re-shoots necklace. 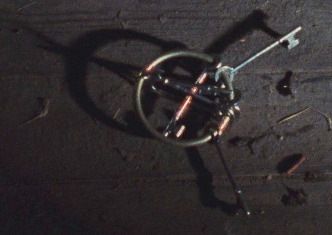 After Evil Dead II, that third necklace was passed on to Tom, who displays it in The Evil Dead's re-shoots box, alongside many other rare items; such as Bruce's fake arm from Within The Woods. 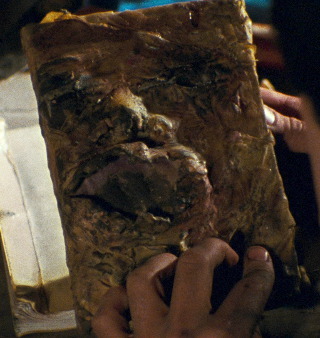 From The Evil Dead; the 'Book of the Dead', and various latex appliances including masks, gloves, and fake parts such as Linda's fake leg, severed head & torso. From Evil Dead II; the 'Book of the Dead' along with assorted 'lost' pages, the 'Kandarian Dagger', and various stop motion animation puppets. There are also a number of photo boards with many previously unpublished photos, original animation storyboards, artwork, posters, and rare magazine & newspaper cuttings. Although it is unlikely that replicas of any of the three necklaces would throw up any copyright issues, there is currently no one publicly producing replicas of this piece. Commissioning a jewellery designer to produce a bespoke custom replica may be an option, but would likely be quite expensive. This is the lantern Ash uses in his initial exploration of the cellar. It's a Dietz No. 2 D-lite lantern made in the early 1900s in the USA. It's fuelled with Kerosene (called paraffin in the UK). While the most popular colour for these is bare metal/silver, the lantern shown on screen appears to be either painted brown, or heavily rusted. In one shot, a clear difference in colour can be seen between the lantern's main brown body and the grey glass protection wire and handle, further in another shot the brown finish appears shiny, so this would most likely be brown paint. They were available in a wide range of colours, so there seems no reason why there wouldn't have been a brown model. These can be picked up on Ebay fairly cheaply, although the condition can vary. 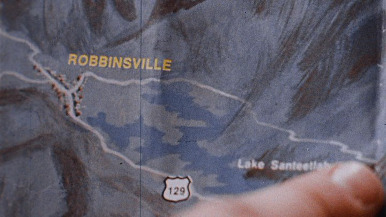 This is the folded map Ash is looking during the car journey to the cabin. 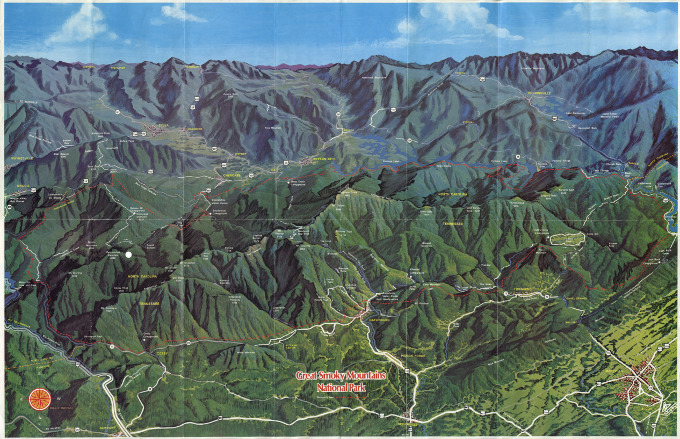 This map has been issued three times by Aerial Photography Services; Pictorial Map of the Great Smoky Mountains National Park Area has a white cover and was released in 1971, Souvenir Pictorial Map of the Great Smoky Mountains National Park has a green & blue cover and was also probably released in 1971, and Souvenir Pictorial Map of the Great Smoky Mountains National Park with the yellow cover released in 1975. The main maps on the front are identical, just differing on what's on the back & cover, both 34" wide by 22" tall. The main map was painted by artist Bill C. Brown. 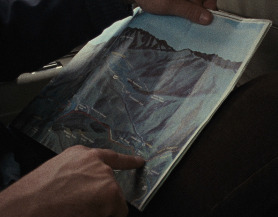 In one shot, you can just briefly see the folded front cover of the map which appears to be the white original, rather than the later yellow re-issue. These are hard to come by given that they're over 40 years old, but come up on Ebay.com every so often and are usually very cheap. All this information is entirely thanks to the persistent research of Irish fan Conor Jennings. You can download a high quality scan of the original 1971 issue of the map below. It was scanned at 600dpi, but given it was two sides at nearly 3ft x 2ft, even at 85% compression JPEG that still gave a huge PDF over 200mb in size, so it was reduced to 300dpi. If anyone wants a copy of that full quality 600dpi scan, just get in touch. 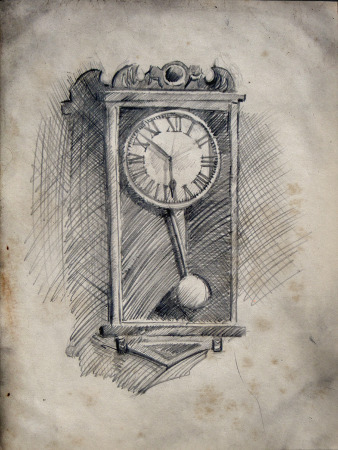 This is the pencil drawing of the cabin clock, drawn on screen by Cheryl, but in real life by Tom Sullivan. Tom did sell printed replicas of this drawing, along with many other artwork prints though his site and at conventions. Danish fan Jesper Mørch drew the below-right replica in pencil on a piece of 11" x 14" sketch pad page, which he then aged and distressed. A top-right section of a Hills Have Eyes poster can be seen stuck to the wall over the table in the cellar. This was the standard US 1977 1-sheet 27" x 41" folded theatrical poster, which while not that rare, still can fetch upwards of $100 on Ebay. 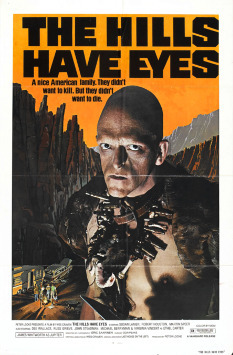 The reason its inclusion as many fans will know off-by-heart, is that around the 60 minute mark in Wes Craven's 1977 film The Hills Have Eyes, after Jupiter & Pluto's attack on the Carter family camper van, Doug bends down to check on Brenda. 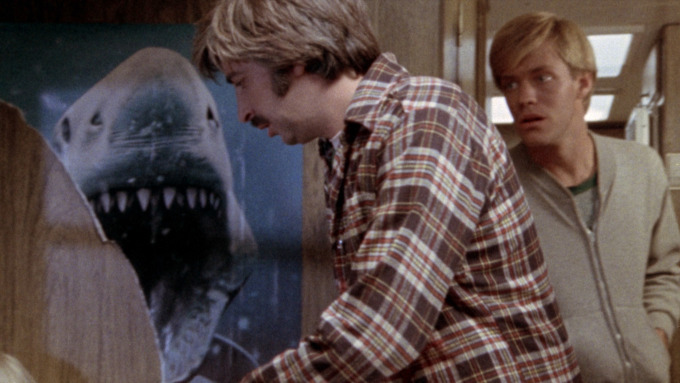 On the wall behind him can be seen the torn top-right half of a 23" x 18¼" 1975 Jaws poster, an alternate design put together by the Western Graphics Corporation for Universal Pictures which today is actually really rare. Upon seeing this, Sam Raimi assumed it to mean that Wes was saying "Jaws was just pop horror, this is real terror", so Sam put a torn Hills Have Eyes poster in The Evil Dead's cellar as his own homage as if to say "No, Wes. Your picture is just pop horror, this is what it's about". This theme followed on. At around the 35 minute mark in Wes Craven's 1984 film A Nightmare On Elm Street, Nancy can be seen watching TV trying not to fall asleep, the theatrical trailer from The Evil Dead is playing on the screen. Then in Evil Dead II in 1987, a Freddy Kruger glove can be seen hanging overhead in the workshed set as Ash first opens the door at the 20 minute mark, as well as to the left of the middle door as Ash walks through the cellar at around 88 minutes. 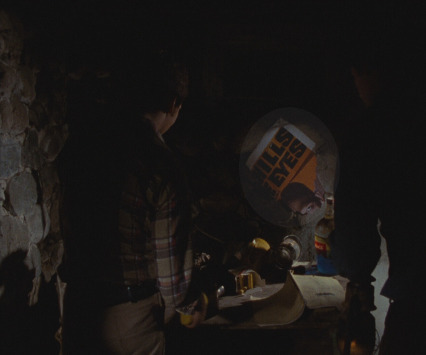 In addition, while not seen in the film, a torn A Nightmare On Elm Street poster is visible in a couple of promo photos taken of Professor Knowby dictating his translations in the cellar (these are around 160-ish on the Evil Dead II - Photo Gallery page). 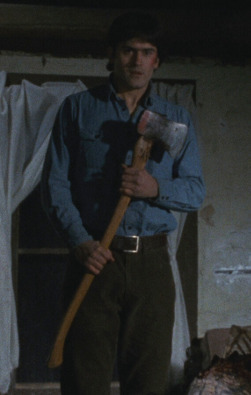 The axe seen throughout The Evil Dead is a True Temper Kelly Works Woodslasher. 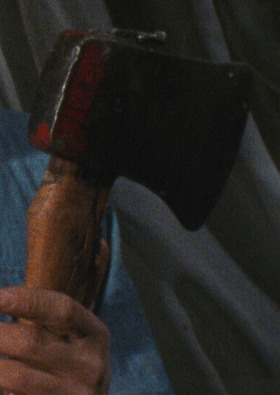 While the axe seen on screen is in poor condition, you can see the rounded edges, red painted single-bit head, and orange-brown stained hickory handle typical of the Woodslasher axe between the 1960/70's. 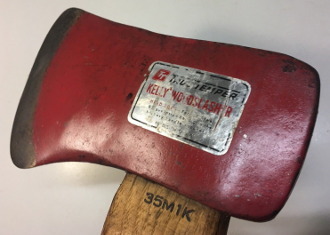 The Kelly Axe & Tool Co. have confirmed this. 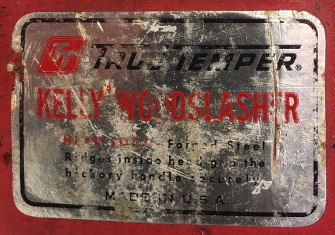 Here you can see some screenshots above, comparing the screen-used axe, to photos below of an original True Temper Kelly Works Woodslasher. Below you can see a photo of a personally made replica of The Evil Dead's axe, created by distressing & aging a brand new axe, specifically for use in the 2016 Evil Dead fanfilm Book Of The Dead. The cabin keys seen on screen are currently in the possession of Don Campbell (Bruce's brother) according to Ryan Meade's 2013 documentary Invaluable. 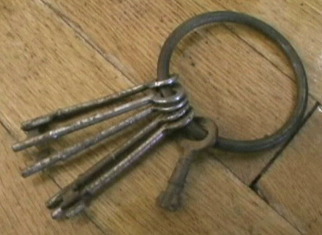 These are five 3"-3½" mortice keys (aka Skelton / Mortise) on a roughly 3" solid brass ring, and one smaller 1½" padlock key. While it might not occur to most viewers, these probably weren't the actual keys to the cabin (hence why they didn't stay in Tennessee, and why they looks so new on screen). When the production first took it over, the cabin had no doors or trapdoor among other things, so any locks/keys would have been sourced by them. Putting the keys on a large brass ring would have allowed the plot device of the keys getting stuck in the doorframe to work. 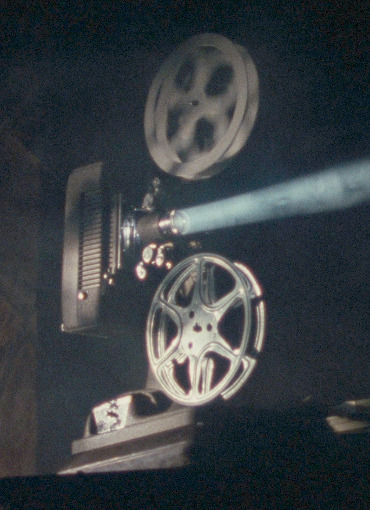 The projector seen in the cellar, which explodes during the 'Blood Flood' sequence, is a 'Model 48' 16mm silent film projector which was manufactured through late 1940s & early 1950s by the Revere Camera Company in Illinois, USA. As the name suggests, this is a picture only projector with no audio playback facility. 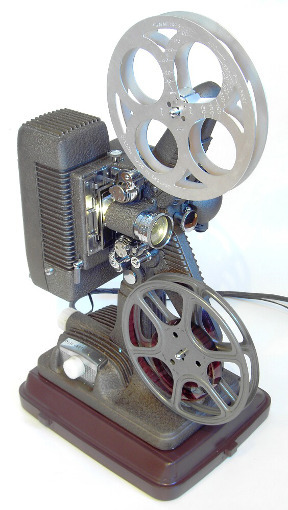 If complete, this projector should come in a case, with instructions, and one 16mm film take-up reel. Of the two differing styles shown in the above screenshot, the top reel is actually a British made Cyldon 16mm aluminium reel, with a 400ft capacity at 7-inches in diameter, the bottom reel is identical to the one in the right-photo below, also 400ft capacity at 7-inches in diameter. 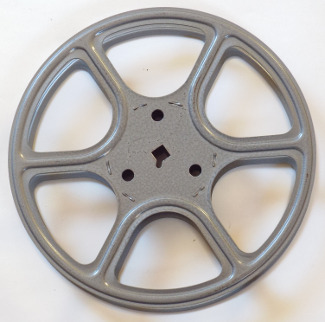 While there are no markings on the reel to identify it, it might have been made by a company called Frome. This projector also comes in two similar colours, the far more widespread bronze/tan colour, and slightly rarer darker grey colour. It was the darker grey colour which was used in the film even though it looks black in the dark cellar. While these can be picked up fairly cheaply on Ebay, when packed it will weigh around 9kg/20lb, so expect to pay more for shipping than you do for the projector, especially if you live outside the USA. Should you need to get one, this projector takes type 'DDW', 'DDB', or 'DDY' 750W, 120V incandescent bulbs. The three are all identical in size & shape, but DDW has an average life expectancy of 10 Hours, DDB of 25 Hours, and DDY is 200 Hours, so expect to pay accordingly. These aren't made new anymore, but they're widely available on Ebay second hand. Bear in mind that having been produced in the USA, this projector is made to work on the American current of 115v, so if you live in a country which uses 240v, plugging it in will fry the electronics inside within a few seconds. In order to use it you'd need a pretty heavy duty power transformer rated for 1000w/1kw or higher output (which will rougly be in the region of £70/$120 new). 115v bathroom shaver sockets don't output anywhere near this much current, and might well fry or trip-out trying. This is the wooden pendulum clock hung in the cabin, seen in The Evil Dead, Evil Dead II, Army Of Darkness, and even the 2013 Evil Dead remake. It's an Ansonia Regulator clock named the 'Ledger No.1', an 8-day timepiece around 37" tall, 17½" wide and 5" deep, with an 13" diameter clock-face and 4½" pendulum. 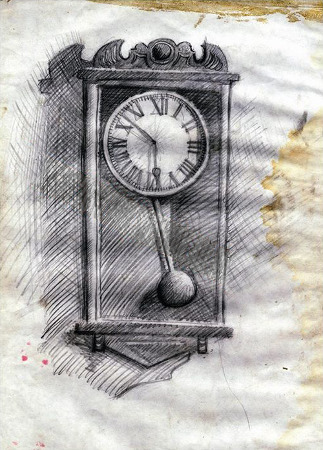 It was first listed in the 1911 copy of the Ansonia catalogue, although this is shown with a different paper clock-face, so the one shown in The Evil Dead trilogy would not been the original. Sam mentions in the 1999 Elite Entertainment DVD commentary track for The Evil Dead, that it was bought from an old clock store specifically for use on the production, and was modified by the store owner to allow the hands to rewind, stop, and fast-forward in real time at the flick of a switch. This was one of the few props which survived The Evil Dead intact. 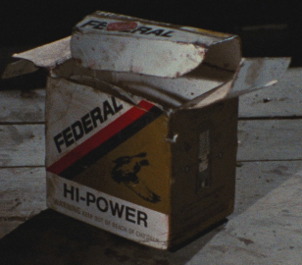 Once shooting was completed, Sam took this back and hung it in their Fearndale offices, where it remained until 1986 when he brought it with him to Wadesboro for use on Evil Dead II. What happened to it after Evil Dead II is unknown, although it most likely went back to Sam as it also appeared in the 2013 Evil Dead remake. 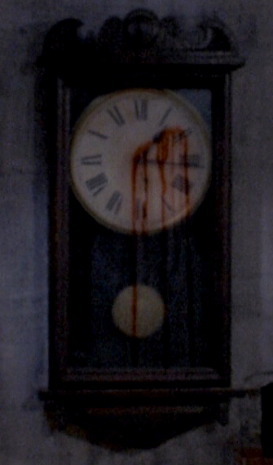 This same clock features in Thou Shalt Not Kill... Except, along with the shotgun. It can be seen in the background of Stryker's cabin in various place through the film. Finding an original clock for sale would would be virtually impossible, and even then the price may run into thousands of dollars as it's a genuine antique. Ansonia made a large range of such clocks, the similar but far more widely available 'Regulator A' model usually fetches from $300 to $1,000 on Ebay depending on the condition, and there are usually a couple listed at any one time. The 'Ledger No.1' is far far rarer. Only two are known to have come up for sale publicly in recent years, and both fetched a high price. In October 2015, US fan Marc bought a matching clock on Ebay. 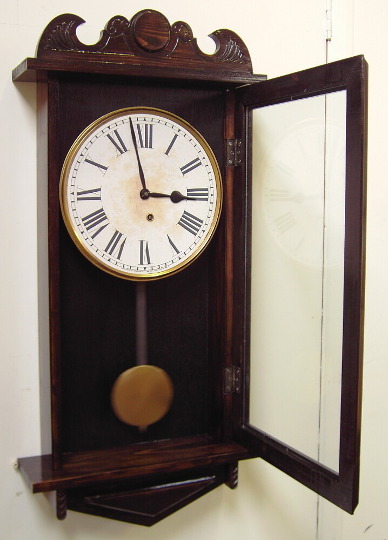 The clock did need some work; the mechanism had been replaced with a modern battery powered version, the hands & face needed to be replaced, and the wooden frame needed some restoration work. The result is stunning and virtually identical to the screen-version. You can see it above-right. Making your own replica of the clock is a much cheaper prospect, and isn't hugely difficult given you have the materials, skills, tools and machinery needed, especially given the various high quality blu-ray movie releases which can be used as a reference. A January 2013 personal pet project to make a replica is shown above, and detailed on the Replica Clock Project page. As of nearly a year later in December 2013, it's still ticking away. The same tape recorder was used in both The Evil Dead & Evil Dead II it was a Panasonic Solid State RQ-706S reel to reel tape recorder. It originally belonged to Bruce's dad, and it was also used to put sound to a number of the Super-8 short films they made together. Once shooting had wrapped on The Evil Dead, Sam took this back to their Fearndale offices, where it remained until 1986 when he brought it with him to Wadesboro for Evil Dead II. It is unknown what happened to the tape recorder after this, but it would seem likely to have been kept either by Bruce or Sam, assuming it survived intact. Panasonic stopped making these a long time ago as the technology became obsolete, but you can pick them up second hand on Ebay from time to time, selling in the region of $20 - $50 depending on the condition, and any accessories. The postage can be quite steep especially if you're shipping it overseas, as the player itself is quite heavy at 7.9kg. It's worth adding that finding a complete player isn't easy as most of the players listed are missing one or both of the black rubber reel retention knobs, actually you can see in the below screenshots that The Evil Dead's player was missing one, and the Evil Dead II's player missing both of them. 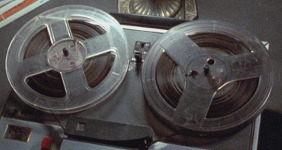 The tapes that go with it are just called reel to reel tapes, and you'd buy them either by size (if you wanted a blank one) or by what's on it (for a pre-recorded one). 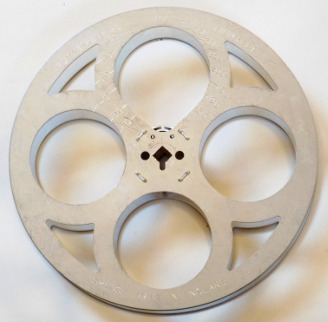 For the most part, plastic reels of this type come in two standard sizes (diameter); 5" and 7". The bigger the reel, the more tape you can fit on it (which means you can make a longer recording). 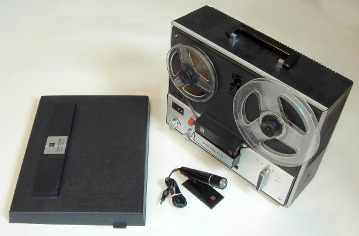 The magnetic tape itself is 1/4" (6mm) wide. 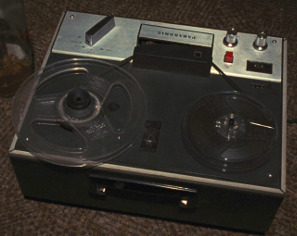 The Evil Dead features the recorder with one 5" and one 7" reel, both Scotch branded but different styles, and Evil Dead II with just has two 7" reels, one clear unbranded and one smoked Radioshack reel. You can see screenshots of both above. Above you can download a scanned 20 page PDF version of an original Panasonic Tape Recorder Service Manual for the RQ-706S. The first 16 pages are sized to print out on A4 paper, while the last 4 are around twice that size and will need to be shrunk when printed by your PDF reader. Bear in mind that as it's a service manual, this doesn't give instructions for normal playback use, it's intended for disassembly & repair. 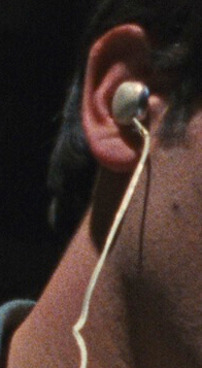 Just prior to Cheryl's possession in The Evil Dead, Ash can be seen listening to the player with a single headphone. 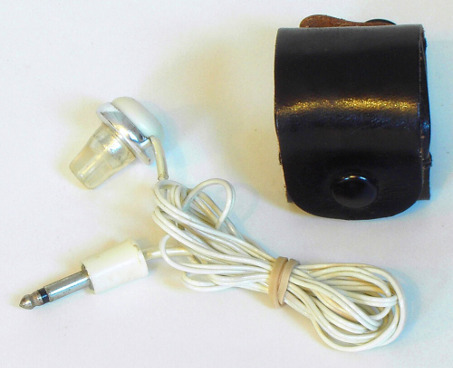 There were many very similar looking white/silver generic earphones made over the years, and the one shown in the above-left photo is probably the same, although it simply has 'Made in Japan' moulded into the white plastic, with no other markings to identify it. If anyone knows what this is, please get in touch. Ash's car was a 1973 gold/yellow Delta 88 'Royale' Oldsmobile 4-door hardtop, with number plate '586 IKV' (which can be seen at the beginning of Army Of Darkness) registered in Michigan, which was made by the Oldsmobile division of General Motors in Lansing, Michigan; Fairfax, Kansas; Arlington, Texas; Framingham, Massachusetts; Linden, New Jersey; and Fremont, California. The Delta 88 Oldsmobile 'Royale' and standard 'Sedan' are virtually identical, only really differing on the post between the front and back doors. The 'Royale' also has a prettier interior and cruise control. This car was owned & driven by Sam personally, and appeared in a number of his Super-8 shorts and most of his feature films, including more recent productions such as the Spiderman franchise. Second hand prices vary widely according to the condition. For a 100% mint/garage kept Delta 88 with low miles, expect to pay over over $5000. A model which is in serviceable condition but would need some restoration work would be in the $1000 to $1500 range. Anything under $500 would likely just be junk. Thanks to Italian fan Emanuele Crivello, you can download a high quality scan of an original 1973 General Motors 1973 Oldsmobile Catalogue below. between August 2009 to May 2010, American fan Bryan Sanders undertook a project to restore an old dilapidated Delta 88 Oldsmobile 'Sedan', to match Ash's car, buying it for around $1500 including delivery, and investing a further $3000 in parts & labour. The minor differences between the 'Royale' and standard 'Sedan' models aside, the results are virtually perfect. While he has no intention of parting with it, he has given a rough selling price of $7000 as a guide for this site.